CIRCLE Indonesia has been regularly providing this training since 2011. Participants of the training sessions have expressed their satisfaction of the training provisions, including those from TIFA Foundation, KEHATI, Social Impact Timor Leste, Aceh Development Fund (Oxfam’s partners), Aliansi Jurnalis Independen (AJI), LP3AP Wamena (Oxfam’s partners), Medicine du Monde, CRS Timor Leste, World Vision Indonesia, Bank International Indonesia, Pertamina, BP Migas, etc. Some of the expressions about Monitoring and Evaluation training conducted by CIRCLE Indonesia can be seen in this link: 4 days in 4 minutes: What They Say About The Training on Program Planning, Monitoring & Evaluation. 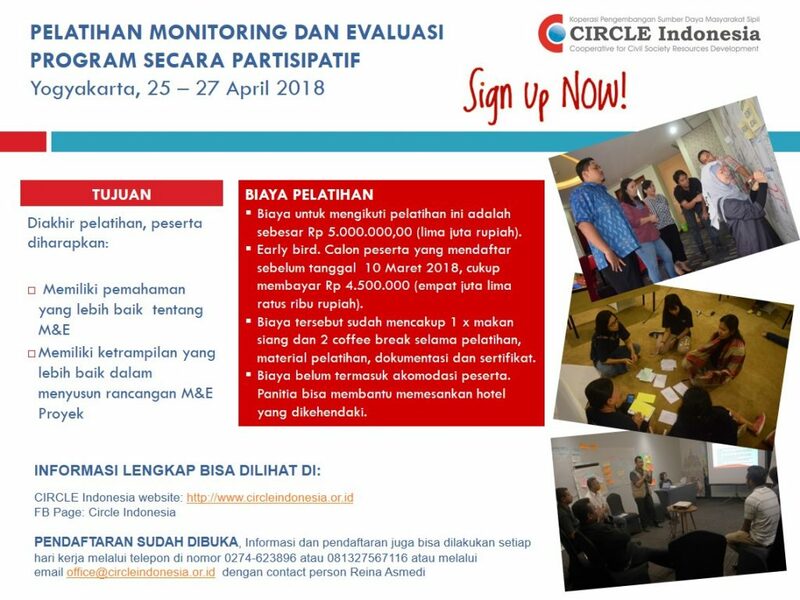 In 2018 CIRCLE Indonesia will be held a Training on Participatory Program Monitoring and Evaluation on 25 – 27 April 2018. The training will be held in bahasa Indonesia.